One less obvious, but potentially fruitful strategy for employers to help improve the mental wellbeing among some employees with depression or depressive symptoms is engaging them through the fulfillment of certain critical psychological needs in the workplace. Engaged employees demonstrate an elevated willingness to participate in workplace wellbeing programs and boast elevated physical and emotional health when compared with those who are disengaged. Engaged employees also have a better mood during the workweek and do not experience increased stress from prolonged commute times. WASHINGTON, D.C. — Americans living in the nation’s metropolitan areas with the lowest wellbeing are about twice as likely to report having a heart attack than are residents living in the metros with the highest wellbeing. An average of 5.5% of Americans living in the 10 metro areas with the lowest wellbeing in the U.S. report having had a heart attack, compared with 2.8% of residents in the 10 metro areas with the highest levels of wellbeing. 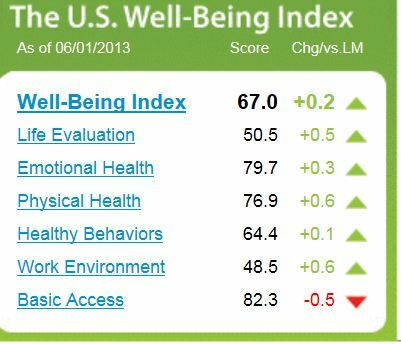 The metros with the highest Well-Being Index scores in 2012 include Lincoln, Neb. ; Boulder, Colo.; and Provo-Orem, Utah. Those with the lowest Well-Being Index scores in 2012 include Charleston, W.Va.; Huntington-Ashland, W.Va.-Ky.-Ohio; and Mobile, Ala. Out of the approximately 3 million adult residents living in the 10 metro areas with the lowest wellbeing, about 161,000 have experienced a heart attack. If these cities experienced the same rate of heart attacks as what is found in the 10 metro areas with the highest wellbeing, nearly 80,000 fewer residents would be heart attack victims. To measure the heart attack rate, Gallup asks respondents: “Has a doctor or nurse ever told you that you have had a heart attack?” Nationally, about 4.0% of all adults in 2012 reported having ever experienced a heart attack. Many of the risk factors for heart attacks are also common characteristics found in metro areas with low wellbeing, including obesity, high blood pressure, high cholesterol, smoking, having diabetes, and excessive stress. For leaders of these cites, creating a culture of wellbeing to reduce the chances of heart disease and heart attack among residents of their communities is key. Building such a culture starts with greater awareness and dialogue around wellbeing, coupled with a combination of involvement by schools, businesses, and local government. Above all, healthcare, business, education, and government leaders should discuss common goals and ways they can contribute toward improving the health and wellbeing of residents for the betterment of the entire community. View and export complete wellbeing data by metro area using Gallup’s U.S. City Wellbeing Tracking interactive.